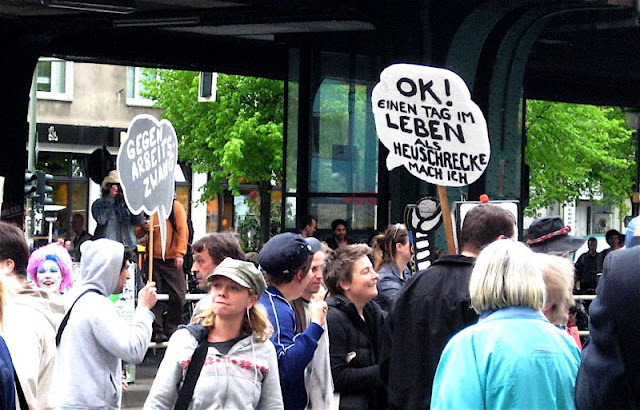 I passed a demonstration on Schönhauser Allee, a crowd of people walking north, followed by a police van. I wasn't really paying attention until I saw the first sign. Robots, huh. The marchers were chanting something which I couldn't understand and someone was egging them on with a loudspeaker. Which, again, was not helpful to me since my German has reached what we will call a plateau. 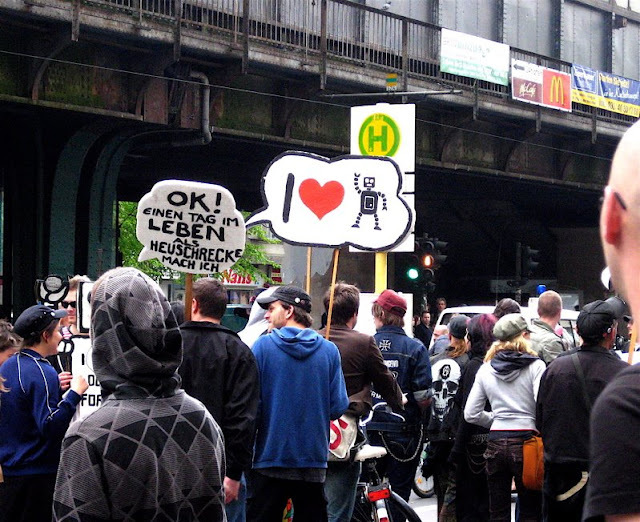 Several people held robot signs, one of which read I WOULD DO IT FOR YOU. What, robot, what would you do for me? This morning I finished a good book, Shadowland by Gordon Stevens, about 1948-1989 Germany and three families in East Berlin, West Berlin and the United States. It was all KGB and Stasi and CIA and exactly what I'd been looking for in those unbelievably lame crime novels I threw temper tantrums over before. This book was believable because it was well-written and because its premise was true: West Berlin's occupation by American, French, and British forces after WWII and the amputation of East Berlin by Russia. Towards the end of the book, when Gorbachev has gone all perestroika on Russia, the communists are losing their grip, and East Germans start hemorrhaging through open borders in Hungary, the revolution takes off. There had been defiant people all along getting their asses kicked and jailed for digging tunnels under the wall and for looking cross-eyed at Stasi agents but their numbers grew in the late 80s. People start meeting in churches in Berlin and Leipzig and marching in the thousands and I can imagine the scenes and streets perfectly because I've now pounded so much of Berlin's pavement: Karl-Marx-Allee, Friedrichstrasse, Unter den Linden. 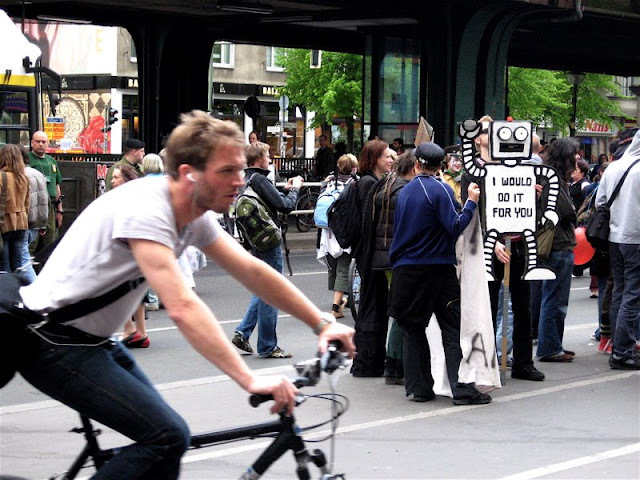 This is what I was thinking when I walked down Schönhauser Allee and saw the robot protest. It occurred to me that I should get a clue as to what makes people march in the street these days so later I tried to translate these signs. And I'm thinking I need to ask Simone when she gets back in town because the best the online translator could do was A DAY IN THE LIFE MAKE AS A GRASSHOPPER DO I. What grasshoppers have to do with robots, I have no idea. Maybe that is a new book title for the Ukranian boyfriend series - Alex goes to a Young Socialist Alliance club meeting! Alex hearts grasshoppers and robots!